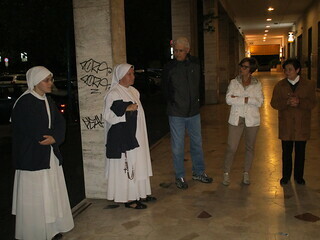 The Servant Sisters of the Home of the Mother in the communities of Lumezzane and Brignano Gera D’Adda (Italy) have been evangelizing for the Parish of St. Francis and St. Clare in Mompiano, Brescia. We were truly on a mission during these days evangelizing many souls, just like has been done so many times in years past. It all began with an idea from Fr. Antonio Lanzoni, the Parish administrator, who had the inspiration to organize a parish mission to try and revive and revitalize the parish. The parish has gone through very difficult times; it has even suffered the collapse of the actual church building, not to mention the lack of participation and support of the parishioners. The solution? A parish mission, a task that was commended to the Servant Sisters of the Home of the Mother. The parish has suffered so much in the past few years that there is no place to celebrate the Mass. The Eucharist is currently celebrated in one of the few classrooms that the Parish has. But now, in the midst of all the darkness, it seemed that a small light was finally shining through. On October 8th the Parish received a new Pastor, Fr. 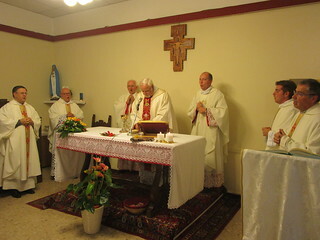 Alberto Maranesi who also counts with the collaboration of three priests to assist him in the pastoral work. Our task was to try and spread this news and in this way bring some hope and light to families. After the opening mass in which the missionaries were sent forth, we began our task which lasted for 15 days and consisted in going door to door. We began each day with Mass at 8:30am followed by an hour of adoration with the Blessed Sacrament. Around 10:00am we began to walk both morning and afternoon, going through the streets and zones that belong to the parish. We knocked on the doors and prayed that God would open the people’s hearts as they were opening their doors to us. Our experience of the parish mission was exactly the experience that God wanted us to have. We found many different reactions throughout it all. Many people did not open their doors either because they were working or because they had gone out to run errands. Others did not open because they did not want to and still others closed the door as soon as they opened saying that they were “not interested”. But we also found many people who opened their doors and welcomed us into their houses with joy, we found people who shared their sufferings with us, their doubts, their stories, their love and hospitality and with all these people we were able to talk and pray. 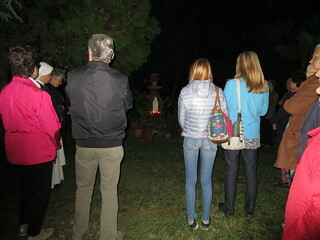 At the end of each day, we invited the people that we had talked to, to come and pray vespers with us at 6:00pm and then have a time for prayer and testimonies at 8:30pm, each day in a different neighborhood. We wanted the people that we visited to experience that God was trying to come close to them. We entrust all of the apostolate that we have done during these days to Him and to our Blessed Mother and we continue to ask for all of these people’s need. We would also like to thank so many people for their hospitality and for others who were so attentive to our needs, especially a few parishioners who prepared the food for us each day and who showed us the places where we had to evangelize. Finally, on October 8th, we reunited to receive the new Pastor and to celebrate the Mass where he officially took on the new parish. Some parishioners prepared a small get-together afterwards with food and sweets to celebrate the coming of their new pastor. Thank you so much to the Parish of St. Francis and St. Clare! We hope that God was able to touch many hearts through this mission and, even though we could not see abundant fruits, we know that in some way, God was able to enter into many houses.